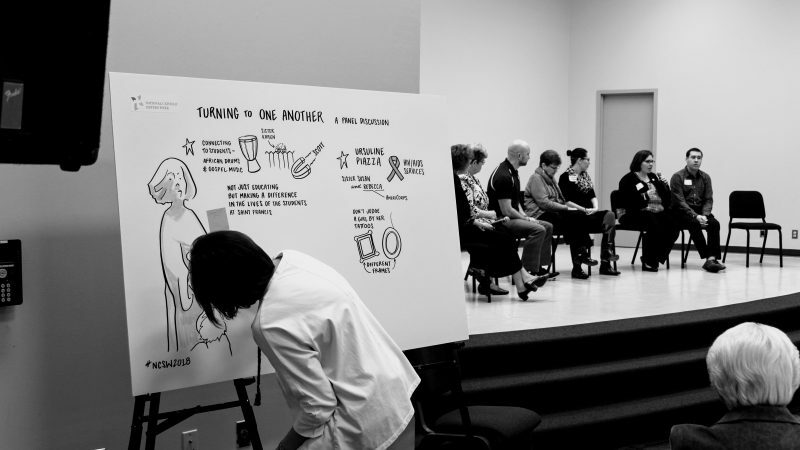 The below article, published by Catholic Health World, outlines how the Sisters of Charity Foundation is working with partners to help strengthen sister-led ministries for the future, through the Generative Spirit program. As announced in this news release, SOCF has been awarded a $750,000 three-year grant from the Conrad N. Hilton Foundation to expand Generative Spirit. 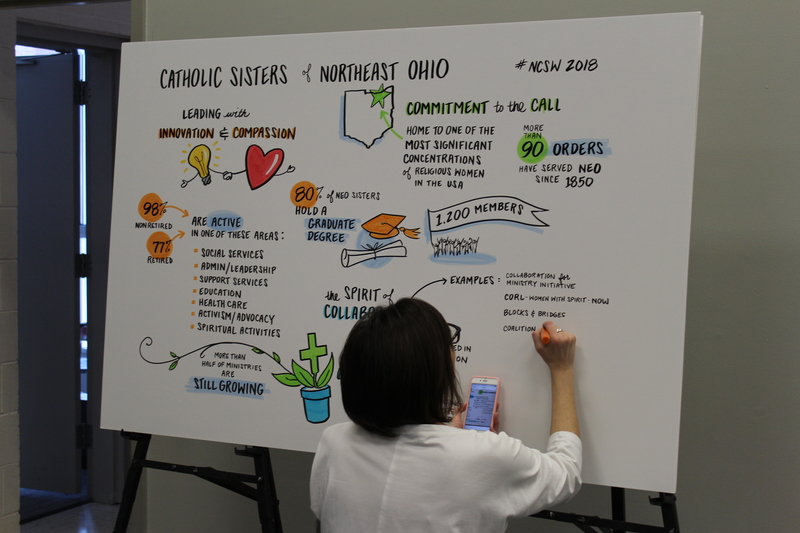 Illustrator Jo Byrne of the See Your Words company creates a “graphic recording” of a March event hosted by the Sisters of Charity Foundation. Held during National Catholic Sisters Week, the gathering was the first of what is to be a series of convenings on social justice topics. A set of initiatives from the Sisters of Charity Foundation of Cleveland and some of its regional partners is helping to identify and develop lay leaders capable of taking over the ministries of women religious who will be retiring in the coming years. The Collaboration for Ministry Initiative is a long-running endeavor involving the Sisters of Charity Foundation and northeast Ohio’s 15 religious orders that aims to address how best to sustain the sisters’ legacies as their numbers decline. Its companion initiative, Generative Spirit, is a two-year-old effort from the foundation that connects the sisters with lay leaders — and in particular young adults — who potentially could carry on the sisters’ ministries after the sisters retire. A new, three-year, $750,000 grant from the Conrad N. Hilton Foundation will bolster Generative Spirit’s early efforts. Through Generative Spirit, sisters across northeast Ohio are engaging with young adults and lay leaders to teach them about the congregations’ approach to leadership and build skills needed to ensure the sisters’ ministries continue to thrive in the future. Northeast Ohio congregations sponsor health, social service, education and other ministries. Generative Spirit includes four main programs. Through “Blocks and Bridges,” sisters will share with lay employees in their current ministries insights on mission formation, communications and marketing, fundraising, finance, board development and other topics. A “Ministry Fellows Program” will pair 20 young adults — likely between 20 to 35 years old — with a “sister companion” for up to a year. Generative Spirit will include research on ministry leadership, the role of retired religious and the engagement of young laypeople. “Convenings,” a program already underway, involves gatherings where several hundred people explore topics including immigration reform, refugee resettlement or gun violence, from the perspective of women religious. The Sisters of Charity Foundation has given more than $2 million to Collaboration for Ministry and Generative Spirit since the efforts to develop laypeople to take over the ministries of women religious in northeast Ohio began 17 years ago. The Hilton Foundation previously awarded the Sisters of Charity Foundation a two-year, $300,000 grant to launch Generative Spirit. Kara Lemma, program officer of the Hilton Foundation’s Catholic Sisters Initiative, said, “If we find that this model works in preserving and transferring sisters’ legacy and charism to … laypeople, we will be working to replicate this model in other geographic regions. “We hope that this will inspire lay leaders to advance human development within their communities, in the same vein that Catholic sisters do,” said Lemma. Other partners in Generative Spirit are the Northeast Ohio Conference of Religious Leadership and the Coalition with Young Adults.